Samantha LOVES the ART STUDIO!!!! My daughter was so excited to hear the the next American Girl of the year was into art! She decided that her dolls should have an art studio, so we went to work! We bought some pieces to make a desk that we had seen online, including 2 wooden letter A's and a wooden plaque. When I looked at making these into a writing desk, the whole thing was too short, but we thought it would make a pretty good art table for Julie. After hot gluing a wooden dowel between the letter A's, then hot gluing the table top on, I hot glued three clothes pins in the upright position, with a fourth stacked in the middle to create a display stand on the table. Then I painted the whole thing white. I cut out all the art images and posters that you see on the wall from the DAVIS arts catalog (davisart.com). I am an art teacher, so I receive this catalog a few times a year. The poster images were the perfect size for the dolls to learn from! On the table you can see the mini-canvases that my girls had fun painting, and the art supplies we from our Saige Slumber Party. I love when we find small things we can use for our dolls! Gracie spotted this tiny ceramic vase at the local thrift store for a quarter! We made the little pencil out of a toothpick. The backdrop was created from a single piece of lavender foam core. I scored the back side of the foam core about 5" from both edges, bend at the seam, and the wall stands on its own! I love that I have been able to find foam core that comes in a variety of colors! It makes an easy backdrop for an amazing doll play room with out a ton of work, and these 'rooms' can be stored easily when not in use! We hung a banner of little flags with sticker letters for a little extra fun. A second string with a few mini-clothes pins works perfect to hang our artwork! We used the "Best of Show" ribbon from the Coconut Pet Set (which she found at the American Girl Outlet) that Zoey gave to Gracie. This ribbon clips on the dog's collar but slides perfectly on the art work too! I love when the girls use their imagination to use American Girl items in a new way! 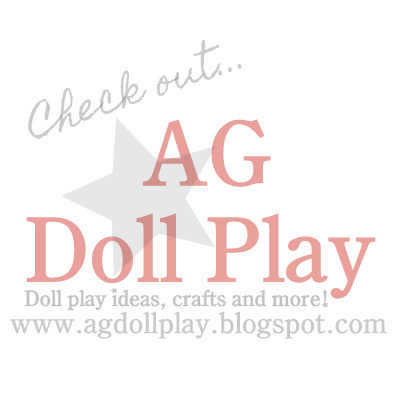 This is definitely Gracie's new favorite AMERICAN GIRL DOLL PLAY space! This post was originally posted by Amanda here. Samantha loves to make art, her easel (see directions here) works nicely in this space too....next on our list is to make a paint smock for her to wear while working! Something a little more artsy- but we think Ivy's hat is perfect! We would love to see what you've been inspired to create for your American Girls- share your doll photos on our facebook page or email them to us! This post was originally posted by Amanda here. That is so cute!!!! I have a question. Does anyone know whether a tri fold board would work as a wall, or would it be to narrow?